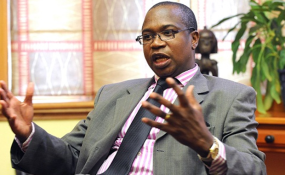 Finance and Economic Development Minister Professor Mthuli Ncube yesterday made a timely intervention as he submitted a detailed paper on Zimbabwe's economic and political reforms to a United States of America Congress sub-committee. The Herald gathered yesterday that the Finance Minister, who is on a world tour, learnt of the hearing at the US Foreign Relations Sub-Committee on Africa and Global Health Policy focusing on "Zimbabwe after the Elections" and decided to give a paper to the convener of the hearing, Senator Jeff Flake. "Minister Ncube got to hear about it in New York, and promptly submitted a statement on the economy to Senator Flake's office to avoid him hearing a one-sided view only," said a Government source. Prof Ncube's intervention came as a local business leader, Mr Joseph Mtizwa, made a formal appearance at the sub-committee and made an impassioned plea for the removal of sanctions imposed by the US and other Western countries on Zimbabwe. Other testimonies came from Deputy Assistant Secretary of State for Africa Mr Matthew Harrington and Dr Todd J. Moss, an academic. In his paper titled, "State of the Economy & Way Forward", Prof Ncube outlined Zimbabwe's prospects underpinned by the implementation of economic and political reforms under the Transitional Stabilisation Plan (TSP) and Vision 2030, which seeks to make Zimbabwe an Upper Middle Income Country by 2030. "The transitional Stabilisation Programme's immediate task is centred on the macro and fiscal stabilisation and laying a solid foundation for attaining the overall goal of a strong sustainable and shared growth," said Prof Ncube. "Such growth will be anchored on good governance and promotion of democratic principles, equitable access to means and outcomes of production, as well as modern infrastructure that supports day to day socio economic activities." The Finance Minister also noted that Zimbabwe was pursuing re-engagement with the international community that bode well for business. "The re-engagement efforts are also raising investors' interest with more than $15 billion worth of projects being negotiated," he said. Mr Mutizwa noted that Zimbabwe, post-election, had made several positive changes under President Mnangwagwa, including the opening up of democratic space, anti-corruption drive and change of leadership narratives from focus on politics to focus on the economy. He added that the reforms had also seen the articulation of a national vision and economic road map for Zimbabwe and aligning Zimbabwe's laws to the 2013 Constitution. However, Mr Mutizwa noted, economic sanctions hindered Zimbabwe's path towards reform and growth while reforms could have unintended consequences. Zimbabwe is under US sanctions, ZIDERA Act of 2001 as amended in 2018 and measures by Canada and the European Union. "In Zimbabwe, trade sanctions impact negatively on economic growth through denying the country access to foreign lines of credit, which ordinarily finance external trade and access to markets, particularly the USA market, through exclusion from AGOA," Mr Mutizwa said. "Furthermore, the country's export competitiveness is adversely affected by negative perceptions of the country resulting in high country risk profile translating into higher country risk premiums. "Due to the above the private sector in Zimbabwe finds it very difficult to access affordable external financing to retool and modernize plant and equipment and access technology," he said. Mr Mutizwa emphasised that Zidera had proved to be a great obstacle for Zimbabwe to access foreign finance. "USA financial institutions are not at liberty to provide well-structured financial support against Zimbabwe's minerals (gold, platinum, cobalt, lithium, etc.,) due to OFAC compliance rules. The same it for banks in Europe due to compliance, reputation and association risks. "As a result of the impact of ZIDERA on the financial sector, the Zimbabwe banks have lost more than 100 corresponding banking relationships over the past 10 years. "The strong view of the private sector in Zimbabwe is that the imposition of sanctions on Zimbabwe by the US and the EU have branded Zimbabwe and its entire financial linkages with the rest of the world as representing high risk thereby making the country a compelling target for de-risking interventions by leading correspondent banks in the USA and Europe," he said. He made a case for the removal of the embargo, noting that the business sectors of the economy all desired to see sanctions removed so that country risk would be reduced and access to affordable long-term credit restored, at the same time facilitating access to global markets. "The private sector's strong view is that sanctions - although they are supposed to be targeted at certain individuals and entities - have the unintended effect of pulling down the entire economy of Zimbabwe and the welfare of all its citizens. Sanctions do constitute a real stumbling block to the efforts of the current Government to get the country's economy moving forward again," said Mr Mutizwa. Deputy Assistant Secretary of State Mr Harrington welcomed reforms by President Mnangagwa, and called for their speedy implementation. "Since taking power last year and since his election, President Mnangagwa has regularly stated his commitment to pursuing political and economic reforms, as well as a better relationship with us," said Mr Harrington. "We welcome the change in rhetoric from the Mugabe years. Since the election, we have seen some promising signs from the government, including appointment of a new, more technocratic cabinet, announcement of an economic plan acknowledging the need for significant monetary and fiscal reform, and a budget which, if implemented, would make important strides in that direction." Dr Moss, who sympathises publicly with the opposition in Zimbabwe, said he was pessimistic about change in Zimbabwe, and made a number of unsubstantiated claims about the country. Senator Flake also scandalously called for the dropping of charges against Mr Tendai Biti, whom he called a friend of the sub-committee. Messrs Biti, Chamisa and Welshman Ncube recently appeared before the sub-committee where they made a pitch for the continuation of the illegal economic sanctions regime. Read the original article on The Herald. Copyright © 2018 The Herald. All rights reserved. Distributed by AllAfrica Global Media (allAfrica.com). To contact the copyright holder directly for corrections — or for permission to republish or make other authorized use of this material, click here. Will Chamisa Win Zimbabwe Opposition Presidency Uncontested? New Bid to Extradite Grace Mugabe to South Africa?